Who Are Plato Cacheris And Jacob Stein? WASHINGTON (AllPolitics, July 15) -- Lawyers for Independent Counsel Ken Starr and the Justice Department faced off Wednesday in a hearing with Judge Norma Holloway Johnson regarding the new subpoenas of Secret Service agents. The Justice Department is fighting Starr's efforts for additional Secret Service employees to testify before the grand jury looking into the Monica Lewinsky matter. If the motion fails the agents could be called before the grand jury as early as Thursday. On Tuesday, Starr expanded his subpoenas to include Larry Cockell, the chief of President Bill Clinton's elite security detail, and several other Secret Service personnel. According to sources Cockell and the Secret Service are fighting the subpoena. Wednesday morning, Starr sent the Justice Department a terse letter complaining that its attempts to block Secret Service employees from testifying are impeding his investigation. A Justice Department source tells CNN that Starr's letter calls the department's action improper and serving no legal purpose. Further, Starr said the efforts are slowing his investigation. 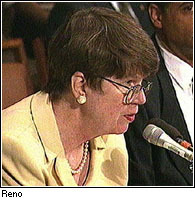 Attorney General Janet Reno responded to the charge that her department is delaying the Lewinsky investigation during her testimony before a Senate Judiciary Committee oversight hearing Wednesday. "We believe that the decision of the court of appeals is wrong," Reno said. "We've not made a determination on whether we would seek Supreme Court review if the court of appeals denies the rehearing en banc, but I will tell you ... with all my heart, it is not done for delay." Starr is investigating allegations that Clinton had a sexual relationship with Lewinsky, a former White House intern, and encouraged her to lie about that relationship under oath. Clinton has denied all wrongdoing. From the beginning there has been deep division at the Justice Department over whether the department should invoke a new "protective function privilege" for the Secret Service. Some officials argued that it simply was not a winnable argument. Others say that the issue is critical to the safety of the president, and thus affects national security. Reno has been particularly swayed by the Secret Service concerns and has deferred to the wishes of Treasury Secretary Robert Rubin. Sources tell CNN that the line of legal defense against the new subpoenas that the agency and lawyers consulting with Secret Service director Lou Merletti are pushing may accuse Starr of trying to get around the Clinton's attorney-client privilege. According to one of the lawyers familiar with the Secret Service position the Secret Service may argue that Starr is attempting to pierce the president's claim of attorney-client privilege in conversations with private and White House lawyers, including perhaps White House Deputy Counsel Bruce Lindsey. Cockell, for example, was in the presidential limousine when Clinton rode with his private attorney Robert Bennett to and from his deposition January in the Paula Jones sexual harassment case. Clinton was repeatedly questioned about Lewinsky during that deposition. The source said lawyers working with the Secret Service are expecting Starr to argue the president effectively waived the privilege by having conversations -- over the phone in the car -- where Cockell or other agents were in a position to overhear. Bennett and David Kendall, the president's other private attorney, released a statement Wednesday saying if this possible Secret Service defense reflects Starr's true motivation, they will fight the independent counsel. "The Whitewater Independent Counsel now appears to be tracking private counsel's meetings and conversations with the President in an effort to intrude on that relationship," the statement said. "Let us be clear: any backdoor attempt by this prosecutor to invade the President's right to consult with personal counsel will be aggressively and firmly resisted." White House Press Secretary Mike McCurry lashed out at the special prosecutor Wednesday for negative comments allegedly made by Starr's staff against Clinton and the Secret Service. 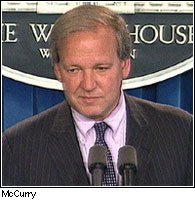 Angered by comments attributed to sources, McCurry said, "It is utterly outrageous and venomous for Ken Starr to allow his staff to impugn the integrity of the president of the United States and the people who are required by law to protect him and if [Starr] had any ounce of decency, he would tell them to knock it off." McCurry declined to describe the comments attributed to members of Starr's office. In addition, McCurry said it would make anyone uneasy to have a Secret Service agent who overhead conversations that were supposed to be confidential subpoenaed to testify. "Any rational human being would have a position on subpoenas issued to someone who had a position of trust, who overheard confidential conversations including conversations with attorneys, who is then required by an overzealous prosecutor to betray that trust," McCurry said when asked about Starr's subpoena of Cockell. CNN's Pierre Thomas and Carl Rochelle contributed to this report.  Larry King Live Transcript: Should Secret Service Agents Have To Testify?